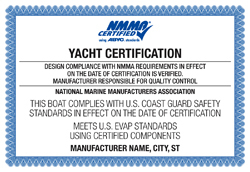 NMMA Capacity tags and Yacht and are available exclusively to NMMA Certified boat and yacht manufacturers. For boats less than 26-ft. and pontoon boats of all lengths. This label includes the CA Emission Control Statement, and allows for customization of Model Year, California Evap family and Emission Control System as required for all boats sold into California beginning with the 2018 Model Year. For boats less than 26-ft. and pontoon boats of all lengths. 4” x 5”. A supplemental order form (download here) must be completed for each CARB capacity tag model ordered. Please note the CA Executive Order number for these labels will be provided upon purchase. A current NMMA Certification Master Model List model ID number required when placing an order. 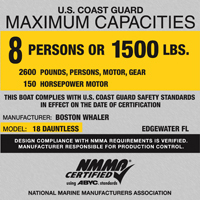 NMMA is now offering capacity and compliance labels that meet the specific requirements for boats sold in Canada. 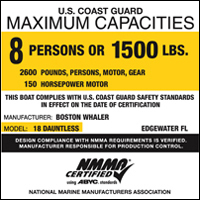 Capacity tags are available for boats up to 6 meters, and the Compliance label is available for boats 6 meters in length and greater. Please see below for label types, pricing, and specific order forms. Please click on the artwork for the order from. Please click on the artwork for the order form.